Avatars–icon-sized images used to represent people online–are usually square. Consider, Facebook avatars are 50 by 50 pixel images. Most source images are not square, however. Cameras typically take pictures with a 4:3 aspect ratio. So to create an avatar from an image, you must do two things: crop it to a square and resize it to your desired icon size. Thumbnails present a similar challenge. When displaying thumbnails in an image gallery, you typically want to enforce at least one of width|height to be the same for all images to avoid a very sloppy look. The cleanest look is achieved with square thumbnails of equal size, though the necessary cropping may not be desireable in every case. Loading an image from a URL is as simple as that. Now you’ve got a BufferedImage. The Image class is a wrapper on a BufferedImage and provides some useful methods for cropping, resizing, and writing (saving) the image. Let me know in the comments below if you’ve found this helpful. Image copyright can be a thorny issue, and most web designers are not legal experts. But you’ve got to be confident that you have the right to use any image you place on your site. If you need an image for free, there are a few sources available. Two are PD Photo (PD standing for Public Domain) and the public domain category of Wikimedia Commons. In fact, all images used on Wikipedia display copyright information when you click on them. If the image has an expired copyright, you can use it royalty-free. Another option is to check the Prints & Photographs Online Catalog at the US Library of Congress web site. Not every image there is free from copyright restrictions, so always double check. Here is their info page on copyright. stock.xchng used to be a good source of free images, however they’ve been bought by GettyImages and require payment now for most of the available content. If you are willing to pay a small fee, I’ve had a good experience with Dreamstime (they’ve recently added a free section, too). Another possibility is to buy one of those stock image collections, such as Big Box of Art or Art Explosion. You get a huge number of searchable, royalty-free images. A lot of the images are not the best quality, but some are useful. One final note: always read the fine print. Even “royalty-free” can have stipulations. If the image features a person, also look for an indication that a model release form was signed (if your project is commercial). UPDATE: I recently found this free image site that provides you with the Photoshop PSD files. 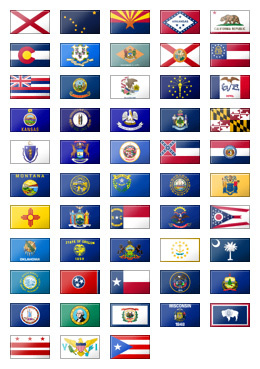 I needed a set of US state flag icons, but I couldn’t find find a nice royalty-free, no-cost set in the size I wanted. So I went ahead and created the set on the left. I think it came out pretty well. The set includes all United States state flags plus Washington DC, the US Virgin Islands, and Puerto Rico. Each flag icon is 40 by 24 pixels. Some required minor cropping or width-extending to fit the uniform size, or to improve the clarity of symbols on the flag. Each flag has subtle shine and shadow effects to enhance their appearance. Feel free to let me know if you’ve found these useful by posting a comment below.